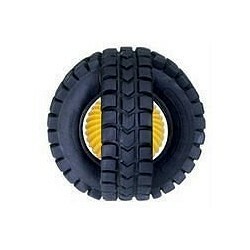 Product description:Animal Sounds X-Tire Balls are a pair of small tires ruggedly molded as a single ball with a motion activated animal sounds babble ball inside. They're easy for dogs to retrieve and the realistic animal sounds will keep your pet company when left alone. Replaceable batteries allow this toy to be around for a long, long time!